By offer you the expertise and unique competence of our product developers, technicians and other staff, we give you the opportunity to, together with us, create high quality products regarding design, durability and above all the combination of materials and attention to details. Below are some of the different functions we focus on in the manufacturing process of high quality socks. It is a specially constructed sole with high level of durability and insulating ability. It absorbs moisture without leaving you feeling wet and cold. It protects the sole of the foot, the heel and the toes from abrasion and blisters and it features a slight cushioning effect. 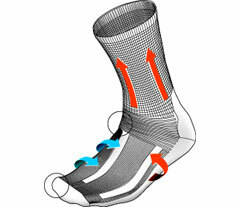 The reinforced areas strengthen the sock and makes it last longer. It protects the sole of the foot, the heel and toes from abrasion and blisters. Also features a slight cushioning effect. Different levels of compression in the sock, highest around the ankle and then a gradual decrease further up on the shaft, prevent swelling and improve blood circulation. A kind of knitting that enables a quicker moisture transportation. The sock has a looped toe seam which means that there is no thick, stiff toe seam, but instead the stitches are looped together with a thin polyamide thread. A special knitted construction on the ankle that creates the perfect fit. A knitted heel creates the best fit and keeps the sock in the right place.